I’ve been so slack with maintaining this blog that I’ve probably forgotten how to create a new post! I’m busy working on pieces for the exhibition to be held by MELD later this year but wanted to show you one of the wonderful Christmas gifts I received. 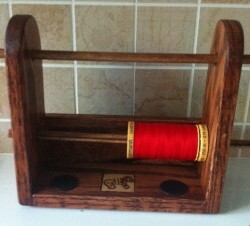 My fellow MELD member, Liz Arnold, commissioned her father-in-law Edgar Arnold to make us all one of his thread holders. They come with two rails to hold thread, two magnets for needles and work a treat in keeping the thread supported and in one place. But, wait, there’s more, as the knife salesman says. Eddy had decorated mine with an incised picture of Horace!!! Thank you so much for a truly individual gift Eddy. It means so much for me to have my little Horace elevated to this status! Hope you can see the little Horace?